This mask provides a healthy dewy complexion. Your skin is nourished and soothed with a cocktail of vitamin B5 and Expert Moist Complex! 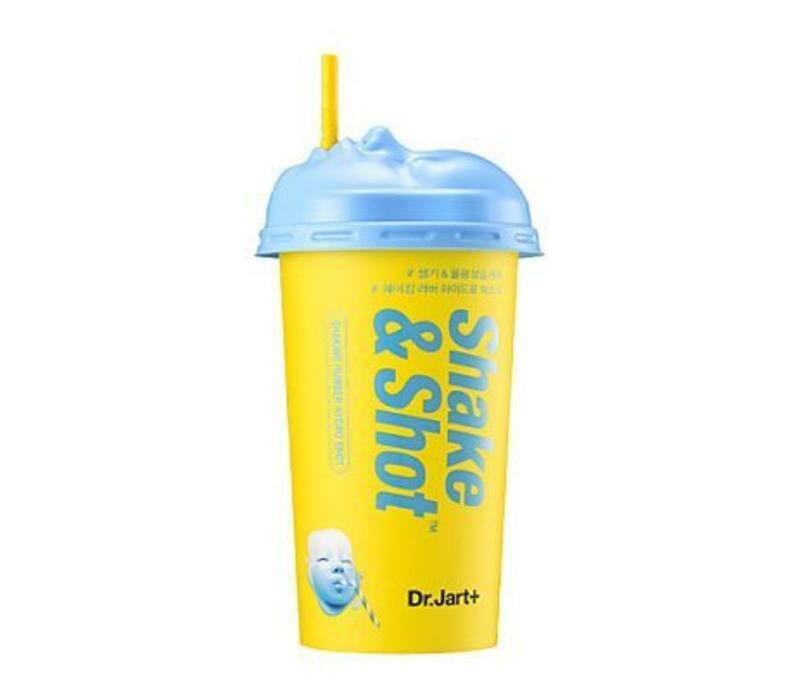 This Dr. Jart + The Mask Shaking Rubber Hydro Shot mask provides a healthy dewy complexion. This funny mask is something else than an ordinary mask and is so fun to use. But besides the fact that it is fun, this mask offers even more benefits. This mask is the solution when you suffer from dry, red skin, resulting in fine lines and wrinkles. Curious about more? This mask nourishes and soothes the skin with a cocktail of vitamin B5 and Expert Moist Complex. This complex is rich in amino acids and improves the natural moisture barrier. This innovative cream-to-sheet formula penetrates deeper into your skin than a sheet mask so that the active ingredients can do their work even better. Each freshly made cocktail ensures that your skin is quickly and efficiently provided with the benefits of this mask. Simply shake well and your skin gets a boost! Provides a healthy dewy complexion. The solution for dry, red skin resulting in fine lines and wrinkles. Nourishes and soothes your skin. Improves the natural moisture barrier. Cleanse your skin and dry it well. Open the mask and remove the spatula from the lid. Put step 1 and step 2 together in the cup. Put the lid back on the cup and cover the hole with your finger and shake! Divide the mask with the spatula over your face in 2-3 minutes, avoid your eyes and your mouth. Carefully remove the mask from your face by gently pulling it. Remove any remaining pieces with a wet washcloth. Then continue with your daily routine. Tip ! : The mask must be applied within 2-3 minutes after shaking! Vitamin B5 (Panthenol): Moisturizes and maintains skin's moisture retention. Baobab Tree Leaf Extract: Rich in vitamins to help moisturize and provide antioxidant protection. Expert Moist Complex: Rich in amino acids to enhance moisture retention and strengthen moisture barrier. Step 01: Cetyl Ethylhexanoate, PEG-8 Glyceryl Isostearate, Phenoxyethanol, Ethylhexylglycerin, Citrus Aurantium Bergamia (Bergamot) Fruit Oil, Trihydroxystearin, Silica Dimethyl Silylate, Algin, Tetrapotassium Pyrophosphate, Calcium Sulfate. Step 02: Water, Dipropylene Glycol, Panthenol, Adansonia Digitata Leaf Extract, Pseudoalteromonas Ferment Extract, Viola Mandshurica Flower Extract, Proline, Alanine, Serine, Sodium Phosphate, Sodium Hydroxide, PEG-60 Hydrogenated Castor Oil, Gardenia Florida Fruit Extract, Citrus Aurantium Bergamia (Bergamot) Fruit Oil, Butylene Glycol, Coptis Japonica Extract, Glycerin, 1,2-Hexanediol, Xanthan Gum, Caprylyl Glycol, Phenoxyethanol, Ethylhexylglycerin.